Super Savings Item! 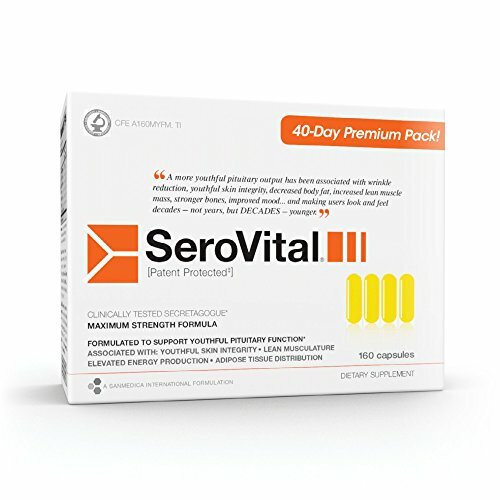 Save 38% on the SeroVital Dietary Supplement, 160 ct by Serovital at Need to Diet. MPN: 857611003186. Hurry! Limited time offer. Offer valid only while supplies last. This patented, clinically tested secretagogue is a maximum strength formula that was specifically developed to support youthful pituitary function. This patented, clinically tested secretagogue is a maximum strength formula that was specifically developed to support youthful pituitary function. Why do we love that? Because a more youthful pituitary output has been associated with wrinkle reduction, youthful skin integrity, decreased body fat, increased lean muscle mass, stronger bones, improved mood, and making people look and feel decades - not years, but DECADES - younger! Key Benefits: Amino Acid Formula For Women and Men Directions Adults take 4 capsules by mouth on empty stomach, either in morning 2 hours before breakfast or two hours after dinner prior to bedtime. Do not exceed 4 capsules in any 24-hour period. Ingredients L-Lysine HCI, L-Arginine HCI, Oxo-Proline, N-Acetyl L Cysteine, L-Glutamine, Schizonepeta (Aerial Parts) Powder. Other Ingredients: Gelatin, Stearic Acid, Magnesium Stearate, Titanium Dioxide, Rice Flour, Microcrystalline Cellulose, Candurin Silver Fine, Yellow #5, Silicon Dioxide, Yellow #6. *These statements have not been evaluated by the Food and Drug Administration. This product is not intended to diagnose, treat, cure, or prevent any disease. If you have any questions about this product by Serovital, contact us by completing and submitting the form below. If you are looking for a specif part number, please include it with your message.